OMR8 -- E.C. Atkins - $160.00 : Welcome to the VintageSaws.com Online Store! 1940 era No 53 "Ship Point" 5 point rip rates fine- overall. Blade measures 26" by 6 1/8" high at heel. Blade clean and bright with faint etch. Fully carved apple handle nice with very minor wear and finish 98%. Elias Cornelius Atkins was one of the larger makers in direct competition with Disston. 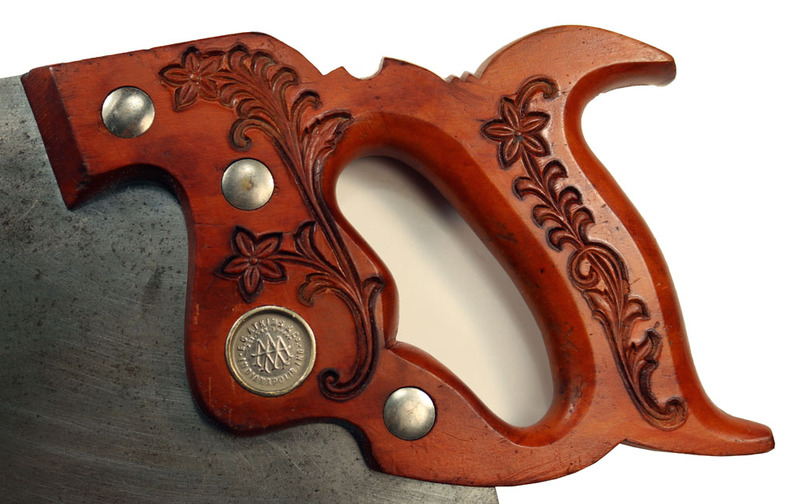 A very nice lighter rip saw with a straight edge and aggressive 5 point teeth. Will make quick work of whatever you need to rip without the fatigue of heavier saws. As with all our first quality saws, this saw is sharp, properly set and ready to cut.